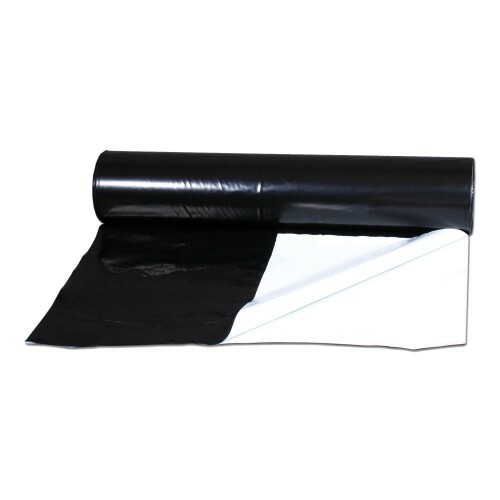 Black and White Reflective Sheeting is a white reflective grow sheet with a layer of black sheeting on the back. Black and White Sheeting can be hung around a grow area to reflect light back from your grow lamp into your garden space. At the same time, the black layer on the back helps to reduce light leaking out or leaking in from the other side. Black and White Reflective Sheeting 85um is 85 micrometres thick and perfectly adequate for most gardens. Please note that while Black and White Reflective Sheeting significantly reduces light-leakage, it is NOT 100% light-tight. If a completely light-tight sheeting is required then Blackout Sheeting may be more suitable for your requirements. Black and White Reflective Sheeting can be hung around your grow-space and indeed anywhere in your grow-room – on walls, even on the ceiling, in fact anywhere that light needs to be reflected back towards the garden. Blackout Lightproof Sheeting can also be used over windows etc. to help reduce light escaping into or from your grow room.